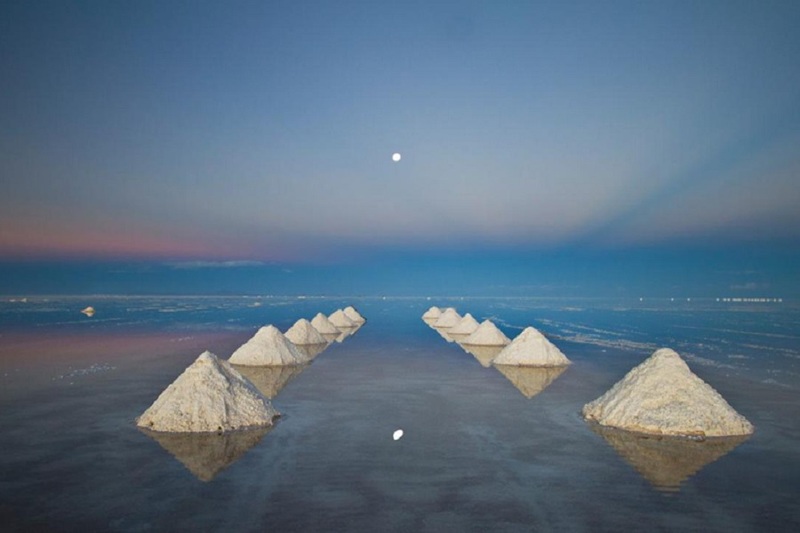 Salar de Uyuni, located in the southwest region of Bolivia, is the world’s largest salt flat with 10,582 square kilometers, near the crest of the Andes, standing at an elevation of 3,656 meters (11,995 ft) above sea level. The Salar was formed as a result of transformations between several prehistoric lakes. It is covered by a few meters of salt crust, which has an extraordinary flatness with the average elevation variations within one meter over the entire area of the Salar. The crust serves as a source of salt and covers a pool of brine, which is exceptionally rich in lithium. It contains 50% to 70% of the world’s known lithium reserves. According to the United States’ National Park Service, there are three basic things that are needed for salt flats to form. These include a source of salts, an enclosed drainage basin so the salts do not wash out, and an arid climate in which evaporation is greater than precipitation so the salts can get left behind when the water dries up. 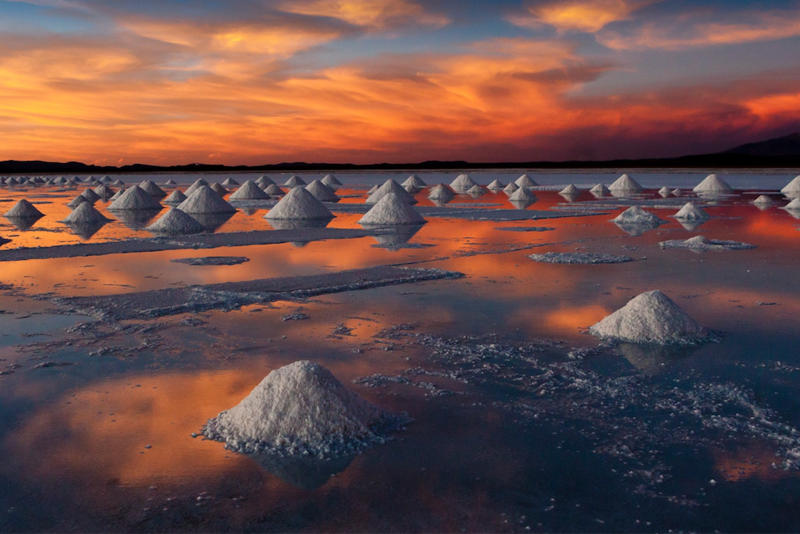 What can you see in Uyuni? 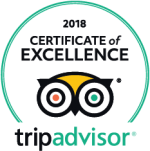 You will find rocky deserts, high snow-capped mountains, colored lagoons teeming with pink, white and grey flamingos, magnificent geysers, lakes belching sulfur, hot springs where you can take a bath at nearly 5000 meters, cactus covered ancient coral islands, a cemetery for trains, and more. 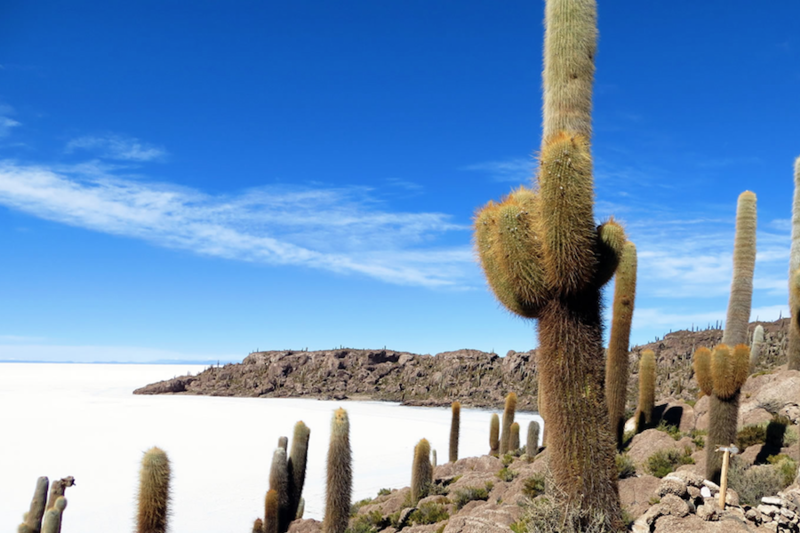 One of the main destinations in the the Uyuni area is the spectacular Isla Incahuasi (Inkawasi or Inka Wasi), an island in a sea of salt covered with giant Trichocereus cacti. 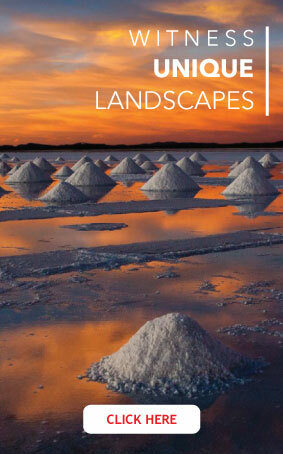 It is famous for the spectacular panoramic views of the salt flat surrounding it. Most tour groups have their lunch here, as there is a cafe-restaurant that serves excellent llama stakes! 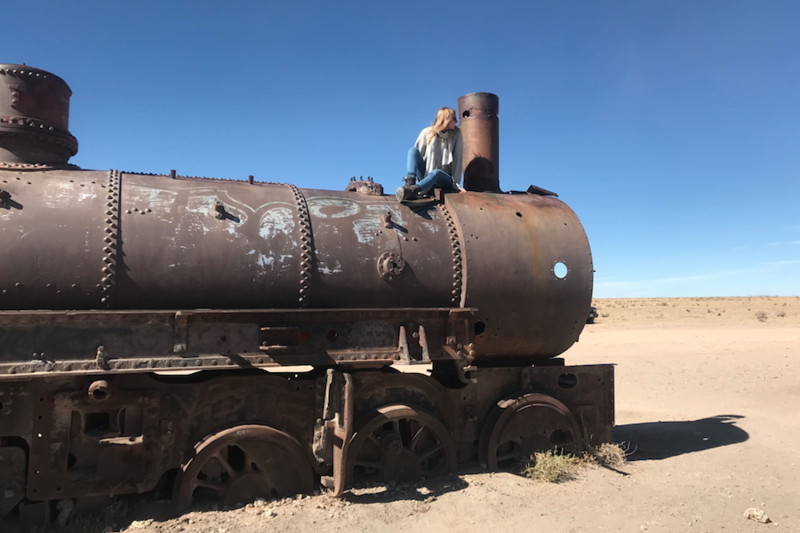 During the 19th century, a big project was initiated to build a bigger network of trains of Uyuni, but the plan was abandoned because of difficulties and tension with the indigenous communities. The trains and other equipment were left behind and now serve as a fantastic background for tourist photos. 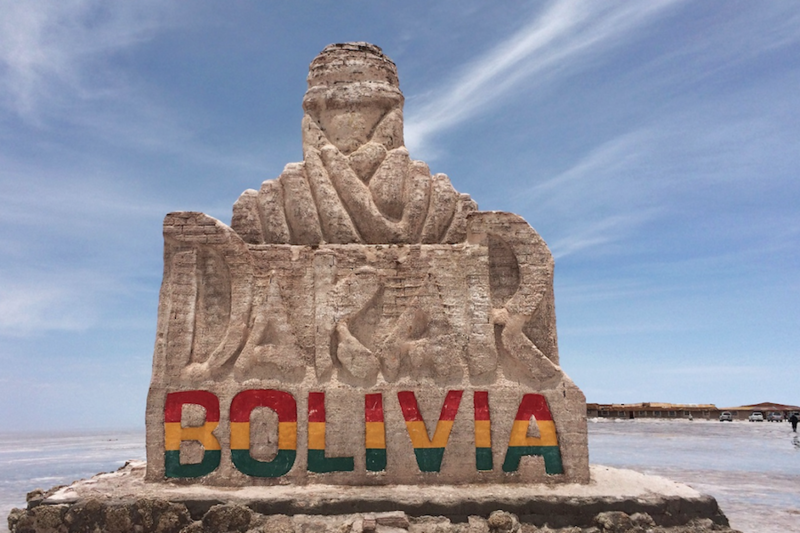 This large salt statue was created to commemorate the passing of the Dakar Rally through Bolivia. Nearby the statue there is an abandoned salt Hotel called Playa Blanca that now functions as a small cafe and exhibition room. A mound of salt has been decorated with flags brought by visitors from all over the world. 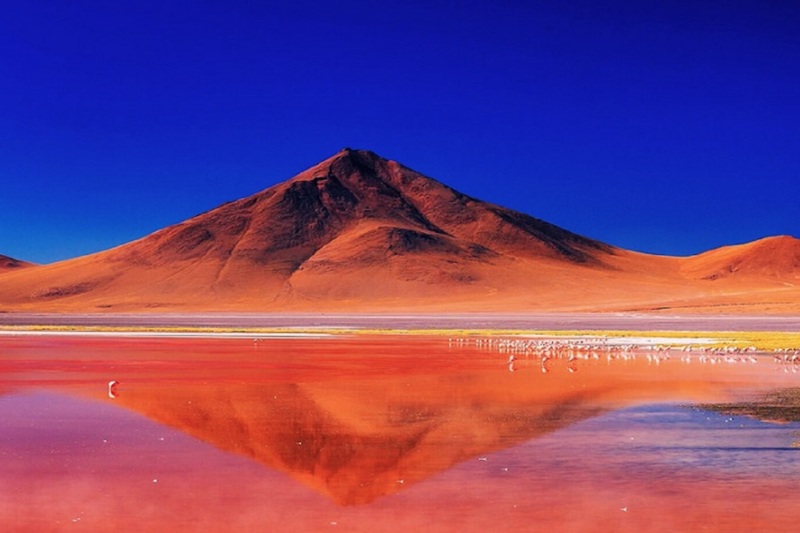 The Laguna Colorada (Coloured or Red lagoon) is a shallow lake within the Eduardo Avaroa Andean Fauna National Reserve and close to the border with Chile. The lake is famous for its strong red color, which results from algae that provide food for large flocks of pink flamingos. The sunset inside the salt flat is an attraction you should not miss. If you are lucky and the Salar is covered by water, the sunset will reflect the flats with spectacular colors. The wonderful reflections that the water create are mesmeric, and the brilliance and variety of colors created is absolutely breathtaking. Stargazing inside the Uyuni Salt Flat is one of the most sublime things you can do for enjoyment and inspiration. There is just something so wonderful about standing or lying or sitting under a starry sky that evokes feelings of awe and wonder. So we invite you to take the next step and visit this spectacular place. 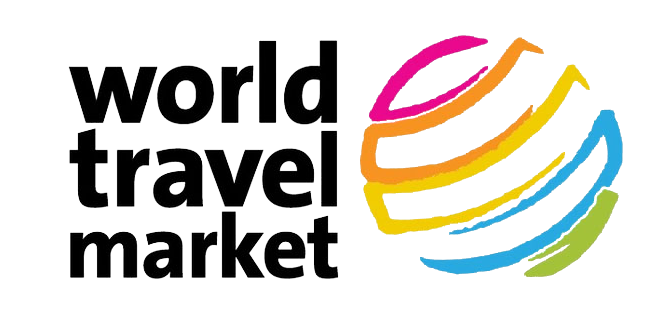 Contact our travel agents today!! !